The newly constructed white colonial house at 12 Covlee Drive was built and recently completed by the multiple award-winning SIR Development. WESTPORT — Swimming in Long Island Sound may be out of the question until next summer, except for participants in any upcoming polar bear plunge charitable fundraising events. Still, the water community of Saugatuck Shores in Westport is bustling with activity throughout every month on the calendar. 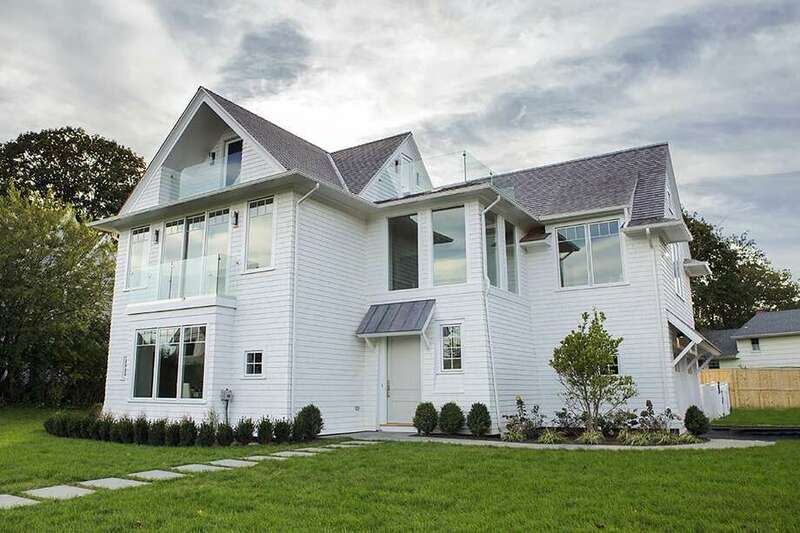 The newly constructed, white colonial house at 12 Covlee Drive will offer its owners a chance to engage in an active lifestyle with long walks and bike rides by the waterfront, enjoying beautiful, panoramic views of Long Island Sound and spectacular sunrises and sunsets. Partial views of the Sound are visible from several of the 11 rooms of this 4,630-square-foot house, built in 2018 by the multiple award-winning SIR Development. Unobstructed Sound views are seen from the second-floor master bedroom suite and the third floor balconies. Architect Tanner White and the in-house SIR design team have combined their talents to create this SIR luxury signature home, a dramatic, one-of-a-kind home, which could be considered a modern beach house. “For 25 years, the SIR Development team has built 180+ homes in Fairfield County and is the proud winner of many HOBI Awards (Home Builders & Remodelers Association of Connecticut),” according to the company’s website. It’s clear to see why when one walks through this innovative living space on four floors. No detail is overlooked. Even the staircase from the foyer to the second floor and then continuing to the third floor is sculptural with its custom metal and oak design and visually interestingly angled risers. The design and build teams were also ahead of the curve with their choice of colors. While most new houses are given a monochromatic gray palette this house received an artful mix of greige and white colors; greige being a color between beige and gray. And it’s not just in paint colors. The beige tone is incorporated into the design throughout the house with the installation of natural-colored oak flooring and exposed natural wood wall in the family room, which has a fireplace with a yellow brick firebox and wet bar with a Marvel wine refrigerator. The color is not insignificant. High-profile interior designers have indicated that people will move from the monochromatic grays of the last decade back to earth tones. Greige is trendy and provides a great transitional color scheme. There is no formal living room or formal dining room in this house. SIR Development built this house to mirror the way people live today, taking into consideration that few people live formally as in the past. Many people forego the use of living and dining rooms, opting instead to hang out in the family room and eat-in area of a kitchen. Entertaining is also a big part of today’s lifestyle. This house accommodates that with its three wet bars; the one in the family room, as well as a Marvel beverage center on the lower level and another on the finished third floor. In the gourmet kitchen, the features include a center island/breakfast bar with a 3-inch thick marble counter, a stainless farm sink, a large dining area with banquette beach seating, high-end appliances include a Sub-Zero refrigerator and 48-inch Wolf six-burner gas range with griddle, and sliding doors to the deck, pool, and yard. The first-floor office features a unique wooden recessed area with a built-in bench flanked by shelving. On the second floor, there are four bedrooms. The master suite features a wall of nearly floor-to-ceiling windows, a rectangular built-in gas fireplace, two walk-in closets, and a sizable, luxurious marble spa bath. The fifth bedroom is found on the full finished lower level, which also has a gym with mirrored wall and rubberized flooring, a media room with surround sound, the bar, and a full bath. The third floor walk-up loft area is ideal as an office, art studio, or quiet retreat. It has a full bath, bar and door to a deck. For more information or to make an appointment to see the house contact Julie Haroun of Westport Residential, LLC., a division of SIR Development, at 203-856-2616 or Julie@sirdev.com.